The Guru QM10 standmount loudspeaker originates from Sweden, where it was originally designed by one Ingvar Ohman. In order to give Ohman's designs wider distribution and a higher profile, a company called Guru Pro Audio has taken over the manufacturing side of things and worldwide distribution is now under way. The Pro connection is implied in the initials QM, which stand for Quality Manager, indicating a monitoring role. Although it has a number of interesting and unusual features, in outline terms this is a very simple two-way standmount speaker, so its £1,595 price tag seems quite steep, especially since the whole thing is finished in dull-but-discreet matte black (a gloss black finish is also available for an extra £100). Although the drive unit line-up looks typical of many miniature monitors, the QM10 is different in nearly every other respect. The most obvious physical difference is the shape. Unusually, the speaker's largest dimension is its width and the smallest its height, so the result is stubby, chunky-looking little box, with an estimated volume of 12 litres. We were immediately reminded of the classic Gale 401 from the 1970s – with the chrome end-caps – though it's much closer to Acoustic Energy's new AE22Pro near-field monitor. One obvious benefit is that the internal dimensions are nicely distributed to spread standing wave modes, though dispersion control is clearly another important factor. The unusual shape could pose problems in finding a suitable stand, so a special version of the estimable 60cm Kudos S50 with a large MDF top plate matching the QM10's footprint is supplied for £175 per pair. The clever bit is that the speaker itself actually floats on four small, but quite stiff foam cylinders. These locate into indents in the stand top and the speaker base, helping to keep location secure, while also decoupling the speaker from the stand in a carefully controlled manner. Reflex-loaded by a narrow slot-shaped port beneath the main driver, the enclosure is constructed as a horizontal wraparound inset base and top, with nicely post-formed verticals. It feels quite a lightweight affair, but is clearly well-braced and stiff, as no vibration is detectable to the touch. The 102mm main driver, exclusively made for Guru by Tymphany, has a very slim roll surround and a 95mm flared paper cone. The tweeter, sourced from German company Visaton, appears to have a small 16mm polycarbonate diaphragm loaded by a short horn and phase plug and looks very much like an Audax design that was popular in the 1990s. 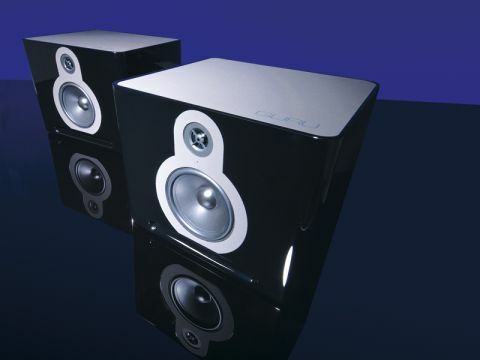 Signal is applied through a single pair of 4mm sockets (Naim style). Ohman says he believes: "Bi-wiring means buy more wiring!" A particularly neat feature is a little blue LED that illuminates if the speaker is being driven into overload. Professional users and others who like their music seriously loud and who, therefore, fear for the health of small loudspeakers, will doubtless welcome this. The final unusual feature is that the Guru is intended for close-to-wall siting, over-angled inwards so that one can just see the outside edges from the listening seat. During installation, the distributor fixed a couple of small panels of eggbox foam to the back wall, behind and inward of the speakers but, that apart, the speaker is exceptionally discreet and takes up little space in the room. The QM10 is rated at 86dB (2.83V) sensitivity, which seems rather conservative. Our in-room far-field averaged measurements indicate a rating something closer to 88dB, but it's difficult to be precise here because the frequency balance is somewhat uneven. That unevenness – rather midbass heavy (40–60Hz), lean through the upper bass and lower midband (80–300Hz) and then peaking up somewhat around 1kHz – might call into question its absolute neutrality and hence monitoring suitability and is bound to introduce an element of sonic character. However, helped by the port output (tuned to 47Hz), bass extension is quite remarkable for such a small loudspeaker, with decent in-room output down to 25Hz. Pair-matching is very good and the amplifier load looks pretty easy to drive too, staying above 4.5 ohms throughout. With just a single terminal pair, the crossover is hard to analyse and the spec describes it as "2-7kHz; non-textbook function". This and the impedance, perhaps imply that the main driver operates to a much higher frequency than usual, while the tweeter just extends the highest frequencies and improves dispersion. That would also seem to tie in with the subjective experience, as this speaker has a good slice of the sort of character that invariably makes speakers with solitary full-range drivers so charming. The QM10 might not have the most neutral tonality, but it more than makes up for that with utterly brilliant time coherence, which is essentially a much tougher thing to achieve, especially across a bandwidth that's impressively wide from something so small. Crucially, the QM10's limitations pale into insignificance once one starts listening to music, whereupon the realisation dawns that these speakers are exceptionally communicative, expressive and entertaining, to the point where the whole experience quickly becomes seriously addictive. There has been some comment in the hi-fi press that a couple of listeners were unhappy about the extreme treble and confirmed a minor problem with high-resolution measurements. While individuals should check this for themselves, it didn't trouble our ears, though some lack of ultimate transparency was just audible when using a bright pickup cartridge. Speech reproduction is not the QM10's forte, as this seems to make its slightly 'cuppy' coloration and mildly 'shut in' character more obvious. But, with all but the heaviest and punchiest music, it really comes into its own, cutting straight to the heart of the musicians' intentions with rare subtlety and delicacy. The texture of orchestral string sections is very convincing and the flow and emphases of a skilled guitar picker are easy to hear and follow. One might, perhaps, wish for a little more bass authority, punch, grip and dynamic tension, but even here the Guru supplies surprising weight and good agility. Stereo imaging is very impressive too, especially for a close-to-wall model, with fine central focus and a decent attempt at depth reproduction on appropriate material. Although it might superficially seem costly, the Guru QM10 represents an excellent choice for anyone who wants to get into the music, while keeping the speakers physically well out of the way.